The mission of the Office of Community Relations is to strengthen the University’s relationships with the Greater Scranton area. The Office is the University’s primary liaison with area residents and neighborhood groups. We are pleased to provide information on the many ways neighbors and area residents can interact with University life and how the University can serve you. We are eager to hear your questions, suggestions or concerns. Please contact the Office of Community Relations at 570-941-4419 or community@scranton.edu. The next Neighbor Night for Scranton residents will be held in fall 2012, date TBD. The Office of Community Relations produces a monthly e-newsletter which is a comprehensive source on upcoming events, University news, traffic or construction updates, University-community projects and more. To subscribe, go to our online form or email community@scranton.edu. Visit our newsletter page to view past newsletters. Nearly every day of the academic year there are exciting events taking place around campus: concerts, lectures, conferences, performances, cultural events and more! Visit the Community Relations homepage to see a selection of upcoming events that are open to the public. Visit the Royals Athletics page for a calendar of upcoming games. The Schemel Forum is an adult educational initiative that focuses on study and discussion of classical texts and current policies, from the arts, history and philosophy to technology and theology. It offers “Insights” luncheon programs, evening courses, concerts and other arts experiences. Visit the Schemel Forum site for more information or contact Kym Balthazar Fetsko, Schemel Forum Events Coordinator at 570-941-7816 or fetskok2@scranton.edu. Performance Music features The University of Scranton Bands, Choirs and String Ensemble, which offer high quality instrumental and choral performances, as well as outstanding and renowned guest musicians representing a variety of musical genres. All performances are free of charge and open to the public, and most take place in the magnificently restored concert hall of the Houlihan-McLean Center. Visit the Performance Music Events page for a list of upcoming performances. 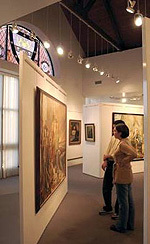 The Hope Horn Gallery at The University of Scranton is a facility devoted to fostering the arts in Northeastern Pennsylvania. All exhibits and lectures are open to the public free of charge. The gallery is located on the fourth floor of Hyland Hall, corner of Linden Street and Jefferson Avenue. Hours are Sunday through Friday, noon to 4:00 p.m., and Wednesdays, 6:00 to 8:00 p.m. (the gallery is closed on holidays and University breaks). For further information, please visit the Gallery website or contact Darlene Miller- Lanning, Ph.D., Gallery Director/Adjunct Faculty, at (570) 941-4214. The University of Scranton Players offer an exciting theatre season that is open to the public. Prices vary. Visit the Players website for more information or contact UofSplayers@gmail.com or Dr. Rich Larsen, Director of the Academic Theatre Program, at 570-941-6327 or larsenr1@scranton.edu. The University of Scranton is proud to be located in Scranton’s Historic Hill Section, the neighborhood that the University, and many of our students, faculty and staff call home. The University strives to foster positive relationships and resolve any problems that arise from off-campus living or construction projects in an effective and timely manner. We are also eager to proactively share information with the community about new and ongoing construction, building improvements and major events that affect life on campus and our Hill neighbors through our Campus & Neighborhood page. We want to hear from you! Questions? Contact the Office of Community Relations at 570-941-4419 or community@scranton.edu.